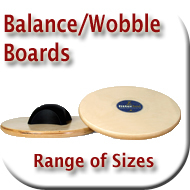 AOK carries a wide range of wobble Boards which will enhance your sports training, rehabilitation or life skills. These include the Fitter range of products - made in Canada from the finest Birch. Your best choice for office and home. Introducing the next generation of Balance Boards. Better Balance, Faster Rehabilitation and Improved Sports Performance. Regardless of your age or ability, daily use of a balance board or wobble board is an asset to your fitness, health and well-being. Personal trainers and physical therapists from around the world recommend Fitterfirst balance training fitness equipment and rehabilitation aids.